TransAID develops and demonstrates traffic management procedures and protocols to enable smooth coexistence of automated, connected, and conventional vehicles, especially at Transition Areas. A hierarchical approach is followed where control actions are implemented at different layers including centralised traffic management, infrastructure, and vehicles. First, simulations are performed to find optimal infrastructure-assisted management solutions to control connected, automated, and conventional vehicles at Transition Areas, taking into account traffic safety and efficiency metrics. Then, communication protocols for the cooperation between connected/automated vehicles and the road infrastructure are developed. 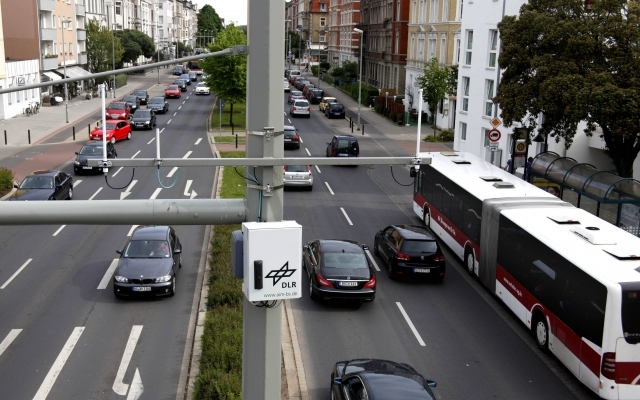 Measures to detect and inform conventional vehicles are also addressed. The most promising solutions are then implemented as real world prototypes and demonstrated under real urban conditions. TransAID is going to prototypically implement the results on real infrastructure hardware. It is planned to use the “Application Platform for Intelligent Mobility” (AIM) for this purpose. AIM includes an ITS reference track, a research intersection equipped with several sensors, various laboratories, mobile infrastructure platforms, test vehicles, and simulation approaches. Finally, guidelines for advanced infrastructure-assisted driving are formulated. These guidelines also include a roadmap defining activities and needed upgrades of road infrastructure in the upcoming fifteen years in order to guarantee a smooth coexistence of conventional, connected, and automated vehicles.